Right from the jump, Mike and GG started throwing shade at their costars. In a discussion about MJ and Tommy Feight’s new home, Andy Cohen asked Mike, “Do you live in the Hills too?” Instead of just saying “yes,” Mike told Andy, “I own mine.” Andy observed, “The shade has already started.” Yes, it has. Then Andy addressed MJ and Reza bringing Shalom Yeroushalmi’s ex wife to MJ’s party and bombarding GG with his presence in front of a crowd. Even Andy thought that was a very shady tactic. He started to say, “I’ve seen some shady stuff on the show.” GG completed his sentence and added, “That was really a whole other level of low.” Pretty much everyone agrees with that assessment. Andy said, “Are you surprised by MJ and Reza? They seemed a little gleeful about it.” GG asked, “Are you kidding me?” Mike remarked, “They plotted and planned this premeditated nonsense.” Clearly. GG continued, “I had no jealousy. I really would not want to be a part of that wedding because were not that class. We haven’t been close for like two years.” Right. If they haven’t been close for two years, then she really shouldn’t be a part of the bridal party. And then then Mike amped up the shade when a fan asked, “Do you agree with Reza’s assessment that you only like dating hoes?” Mike said, “No. Reza is full of crap and he loves to throw daggers. He should be careful because I know the kind of guys he likes to date and what he and Adam [Neely] do in private.” Wow. No one saw that comment coming. Reza and Adam have to be livid about what he was insinuating. 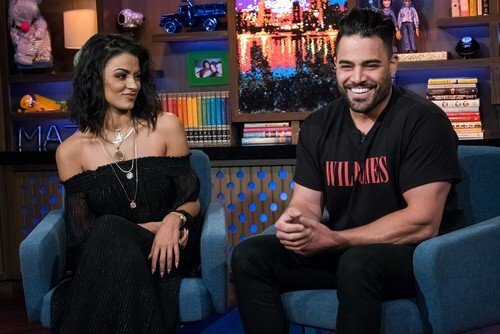 I would have loved to watch Reza watching that Watch What Happens Live episode. Better yet, I would love to see the angry text Reza definitely sent Mike in response. Mike answered the second part of the question as well: “Let me answer that, absolutely because Tommy has seen MJ at her worst. It can’t get any worse than that. It’s only uphill from here. He loves her and I love him for loving her as much as he does.” We are in for a shade-filled season. That’s for sure. TELL US- ARE YOU SURPRISED BY THE COMMENT MIKE MADE ABOUT REZA’S MARRIAGE? WHAT DO YOU THINK ABOUT REZA & MJ SURPRISING GG WITH SHALOM’S EX AT THE PARTY?